I dropped my husband Bill off at eight o’clock so he could catch the bus to the starting line and made my way to the Riverside T Station to park the car. I’d be meeting David, our friend Lindsay’s father, at 9:30 so we could spend the day together watching the race. This was my third time cheering Bill on in the Boston Marathon so I knew exactly where we should stand to get a good view of the runners between miles 16 and 17. The weather was perfect for everyone: not too cold if you were standing around all day as a fan and not too hot if you were running. David and I stationed ourselves pressed up against a metal barrier erected to keep spectators off the route, dug out our cameras, and settled in for several hours of shouting accolades. There’s absolutely nothing like the Boston Marathon with its thousands of runners and hundreds of thousands of fans lining the roads the whole way! I’ve run 25 marathons myself, but since I tend to slog along at the back of the pack, I’ve never hoped to qualify for Boston. My husband, however, has qualified repeatedly, and this was to be his fourth time running the esteemed and celebratory event. I have to admit to a little jealousy as I’ve stood on the sidelines watching the faces of the Boston runners—from the elites to the charity racers—smiling with pride and accomplishment when they pass me. But mostly I’m content to be a fan and feel excitement on their behalf—happy to be one little soul among the throng. Monday was no exception. I signed up to receive text messages to track five different friends, including Bill and Lindsay, as they passed the 10K, half marathon, 30K and finish points. This meant we could stand by watching for them with a decent estimate of when they would be coming through. For a couple of hours we enjoyed cheering for those who came through early—the wheelchair racers and the elite women and men. Around 1pm, right on target, Lindsay passed us. David and I caught her attention and got a satisfied wave from her. Then came Bill a few minutes behind Lindsay. He knew where I would be standing, so he stayed to the right on the route where he could pause and kiss me as he passed. It was all happening as we’d planned, on schedule and without a glitch. Shortly after they’d gone by, David and I hopped on the train to make our way to the finish. From experience, I knew we wouldn’t be able to get close enough to watch our runners cross the line, so when we got to Copley Square, I suggested we go find a cup of coffee a few blocks away and let Lindsay and Bill finish and make their way through the recovery zone before we went to meet them. Once I got the texts telling us they’d both crossed the line, we started back toward the family meeting area. Twenty minutes later, coffee in hand, near where we’d all agreed to meet, we heard a loud BOOM. David commented that someone important must have just finished the race to warrant such a greeting. Wonder who it was? Then there was another BOOM. Briefly it crossed my mind to think, “Could it be a bomb?” but I dismissed the thought resolutely. There could be no reason to bomb a marathon. The blasts must be some sort of planned fireworks or maybe a transformer blew out its power source. In my pocket, my phone buzzed. My friend Brandon tweeted from back home in Washington State, “Are you ok? What’s going on there?” Then I saw that I’d missed a call from Lindsay. When I dialed her back she was frantic to know where we were. I left David waiting for Lindsay and went down the road to look for Bill by myself. People were crying in the family area, but I still didn’t know what was happening. Runners often cry after a marathon. It’s a tough haul running 26.2 miles, certainly cry-worthy! I tweeted Brandon back and asked him what he’d heard. My heart was pounding as I searched the crowd for Bill’s face. A mother passed by me, comforting her crying child. Then another family passed, tears streaking down their faces. Why were the children crying? I tried to breathe, the way I do near the end of a race when, tired and ready to be done, I have to rally my resolve to keep going. I had to focus on my belly rising and falling not to give in to my rising alarm that Bill wasn’t yet at our designated meeting area. I reminded myself that he was typically slow in recovering, that he liked to linger over the food, that he needed to get his drop bag, and that he might decide to change his clothes before coming to the family area. I called David and Lindsay and asked them to come to where I was standing so we could all be together. And then I called Bill’s phone. No answer, but that wasn’t unusual either. Much to my ongoing frustration, Bill rarely remembers to check his phone. Suddenly, my phone was buzzing incessantly with text messages. Are you ok? What’s happening? Are you near the explosion? I couldn’t answer yet—not until we found Bill. And then there he was, walking stiffly toward us—obviously confused by the growing chaos. Still, he was just a tired marathoner happy to see his number one fan, and I was relieved to find him. There was no announcement to evacuate the area; we (and by “we” I mean the four of us, but also everyone else) just knew we should get away from Copley Square. We heard the first siren and knew for sure that someone must be hurt. But soon dozens of emergency vehicles rushed in from every direction; the sound was deafening. Still, the only information we had was coming from family and friends checking on us—incomplete at best—but we knew from the sheer number of emergency vehicles that something big must have happened, something more than an accident or a prank gone bad. People, most unfamiliar with the city, were moving with a growing sense of crisis, disoriented on the street as they tried to get out of the square. Without the full story, no one knew how much to panic or what the continuing threat might be, but everyone seemed to comply with the unspoken understanding that we should get the hell out of the general area. Down in the subway where we learned that the line we needed was closed down, people seemed eerily disconnected from what was happening above the ground. Ignorance is bliss, they say. We ended up in a bar in the Italian part of town—the only place we could easily get to on the subway—and waited out the chaos. It was only then, with access to a television that we learned what had happened: The Boston Marathon had, indeed, been bombed. Bill and Lindsay had been no more than 300 yards from where more than a hundred spectators were injured and three people were killed. Normally, I’m fond of extrapolating life lessons out of race experiences, but there isn’t anything I want to learn from this terrible tragedy which almost (but didn’t) change my life. 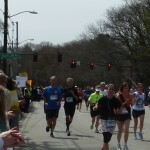 I don’t want to learn to be a more vigilant runner or to stay away from big sporting events. I don’t want to decide the world is more dangerous than I thought it was on Sunday or even that I should hold those dear to me closer. I want to go about my business as usual, trusting the odds are on my side that I’ll be safe in this world, running happily in big races, and getting irritated with Bill when he doesn’t answer his cell phone. I don’t know if I can pull it off, but I don’t want a senseless act of violence to change my worldview—one I’ve crafted intentionally and thoughtfully over the years. There is one thing that has changed for me, though: Next time I won’t be content on the sidelines. I want to go back to the Boston Marathon as a runner and show solidarity and support to a city that hosts one of the most extraordinary events in the world. Thank you Boston. Our thoughts and prayers are with you. I am so beyond thrilled that you and all of your loved ones are okay Cami. I’ve been an emotional wreck over what’s happened, and last night at my weekly Athletes in Action Bible study had some peace, and a return of normallcy to my day. I’m not goign to stay away from the big events. There’s no chance of that ever happening. Bloomsday is only three weeks away and attracts more runners and walkers than Boston does, although it’s spectators are not near the enormity of Boston. It’s still a big race, and there are already releases about more law enforcement being present at the Expo and race day. It’s understandable, it’s how the world reacts to crisis. I don’t think we should change our world view though. Running is such a community involved sport. I had a lot of people tell me they were happy I wasn’t there. Sure, it was a good thing, I’m safe, but I want to be in Boston. I will be there someday, just like you. I won’t be content on the sidelines. As much as I really want to run it next year, I know I won’t be ready by the end of summer to run a three hour marathon. So my plan still stands firm. It still holds true. I’m about a year away from the races I plan on using. I will use Eugene, Windemere, or Coeur D’Alene to qualify for the 2015 Boston Marathon, and I will run the 2015 Boston Marathon without question. A wonderful post. It should be in the papers for its depth and close encounter. I’m glad to know that Bill and Lindsey are okay, though a blast even that far away could shake your ear drums or break glass. Thank you for such a poignant recounting of your day in Boston, Cami. I’m glad you and your loved ones are okay. The human loss and suffering is impossible to wrap my mind around. I imagine it’s going to take some time for you to process all of this. The life lessons, if there are any will come in their time. Hugs. How do 28,000+ runners move forward from such a horrific event? Running 26.2 miles to a single-minded, simplistic goal of putting one foot in front of the other, moving forward to the finish line. The ability levels are as diverse as the people who entered this prestigious race. Dreams of running Boston, lifelong dreams of many locals, out-of-staters, and representatives from other countries all moving forward until we couldn’t move forward any more because of a senseless act of violence that stopped us in our tracks. Thank you for your beautifully written report, Cami. While I had no idea what you would have to say, I just knew your words were the ones I wanted to read about what happened that day. I am so grateful that you and Bill and your friends all made it through without physical injury (or worse). It feels a little selfish to say so, as I know others did not. but I just want to wrap my arms around you and hug tight. I was watching the race from my office computer and was tracking Bill on the BAA website. I saw your tweet about “being okay” and had no idea what had happened, even as Bill finished at 3:48 and the live feed quit near the same time. It wasn’t until later I discovered what had happened. I’m glad you and your friends are safe, and like you, feel horrible for the Boston people. They deserve better. I am glad to hear of your approach looking ahead. Yes, we must be vigilant and it would be a mistake to live our lives in fear. Brandon, a big hug to you. You were the one that alerted me to the trouble and I’m thankful for that. If you hadn’t told me what the news was saying, I wouldn’t have known to quickly let friends and family know we were safe. Take your time, get yourself ready and (whether I’m there or not) I’ll be your fan on the sidelines when you run Boston. Thanks Korin, Kevin, Janet, and Grace for your virtual hugs. On the way home we met some other Bellinghamsters who told us about the kindness they received from others in the disorienting hours after the explosions. I hope in due time we’ll hear as much good news as we’ve heard bad about this event. I’m home now with my dogs and a glass of wine. Still sending heartfelt affection to the awesome city of Boston. I am taking my time. Next year is my qualifying plan. I was close in the fall. I I had been a bit smarter and run the half over thanksgiving break I would be flying right now. Keeping my same timeline and getting in A year of solid training with lots of speed and distance I will easily be ready to run 3 hours if not below that. Many many hugs to you guys. It’s been two days and still I can’t stop reading and watching and listening to everything that’s being said about the awful events in Copley Square. Maybe it’s the graphic human stories, or the “localness” of it, or maybe it’s because we are all so close to this, our marathon. Most likely it is all of the above. In addition to the terrible injuries and death involved, this attacked a part of our community – a tradition dating back to our forebears. Patriots Day is our own quaint, quirky holiday that commemorates events from more than two centuries ago when the people of Massachusetts changed the world forever. The Boston Marathon is our eccentric local marathon – complete with its downhill run for 18 miles, Heartbreak Hill, legendary characters and character – but it is also revered across the planet. This particular marathon is an event when we, as a running community, come together to train, to run, or to cheer on our club mates, unlike any other race anywhere. It feels as if it has been stolen from us. There was little to no panic last Monday. Everyone wanted to help. As one observer noted, civilization couldn’t have come this far without more people running toward the danger to offer aid, than those who would perpetrate such a crime. As all of you, when I got back home I watched the TV coverage showing doctors, nurses, fire and police personnel, marathon volunteers and spectators jump in to help, just seconds after the first blast, not knowing what was next. This was a Patriots Day well named. I realize it is far too early to make plans, but I hope the B.A.A. decides to pick some sunny morning in the near future to complete the race. A plan might include race director, Dave McGillivray, who is traditionally the last finisher, to start in Hopkinton, while all others jump in at the very spots where they had to turn back. Everyone gets to complete the race; those who have run Boston for many consecutive years would maintain their streaks, and, most poignantly, we show the world that terrorism may interrupt us, but does not stop us. 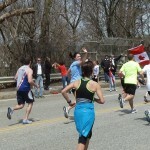 Marathoning, more than any other sport, brings out the best in people. When it’s hot, neighbors situate themselves on the front lawn with hoses to cool down the participants. They offer water and other sustenance. You don’t hear boos from the spectators: only cheering. This week, those on the sidelines offered the coats off their backs to warm freezing runners or to be used as tourniquets to stem the bleeding. Also, unlike any other sport, it is all about endurance – and, with its 117-year history, the Boston Marathon exemplifies that trait. People have said “It’ll never be the same.” Maybe on some level, that’s true, but, for the most part, it will be the same again. We won’t forget. We will be more vigilant, but we will endure. I am confident that if the marathon were run again tomorrow, those twenty-seven thousand – no, one hundred, twenty-seven thousand – would show up, and the people of Boston and the world would line the sidewalks to cheer them on. I see what you mean well about being in the explosion area you don’t really notice how serious situation is. Everyone else who is watchin TV seeing more blood and panics so they well know more that acutally the people around the site. Anyway, hope you had a safe trip back to Washington. Thank you, Ace. Your husband’s article is so beautiful! Thanks for the full report, Cami. Like your friend Brandon, I’ve been an emotional wreck over this. It helped this morning to connect with a fellow runner who truly “gets” why this feels so darn personal. Hope to see you & Bill sooner rather than later.